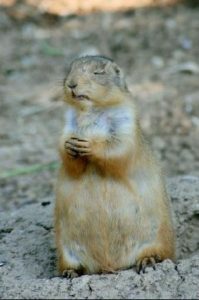 Prairie Dog Prays * Martha Anne St. Claire, M.A. Just before Thanksgiving last year, NPR interviewed Terry Tempest Williams, author of Finding Beauty in a Broken World. In part of the interview, Ms. Williams talked about prairie dogs. Indeed! In peace and stillness, may we find our sacred center and each other, ONE being that we are..